Charles de Gaulle airport was a mess. This is such an out-dated facility with narrow concourses, making it nearly impossible to pull a bag on wheels through the crowds without ramming someone in the heel or knee. We finally made it to the area that was designated for buses that would take us across Paris to Montparnasse, where our hotel was located. Just inside the doors, across the concourse, was an ATM. We stopped there first to get some Euros, and found that the process was fairly easy with no hiccups. Outside, the narrow curb areas were crowded with people waiting for buses. There were no signs indicating whether or not we were in the right place. Buses began coming by, unloading people who were apparently rushing to catch planes at other parts of the terminal. With each unload, I barely managed to talk to the drivers who generally were not very helpful when I asked if the bus was going to Montparnasse. Either there was a shake of the head or a nondescript gesture, neither of which did anything to clarify the issue. 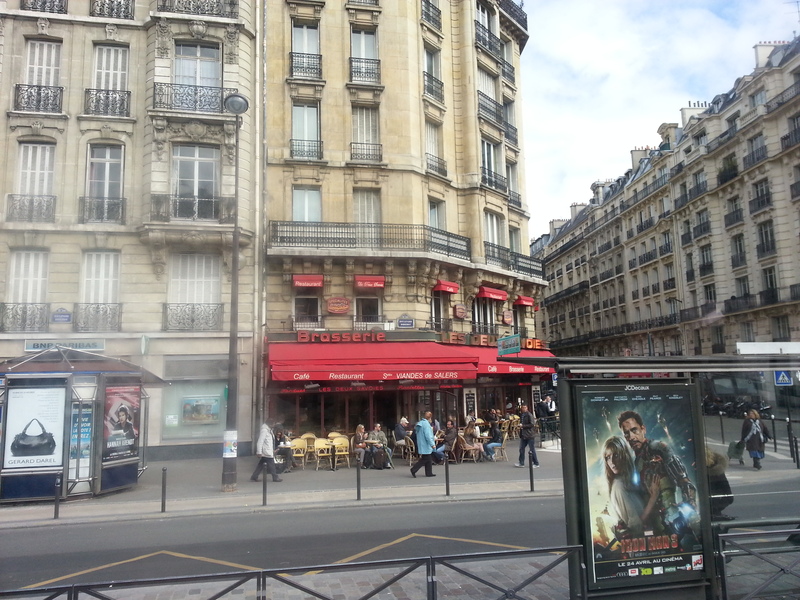 Finally, a helpful red-cap explained that the bus I was standing outside of was indeed going to Montparnasse. We loaded our bags on the underneath baggage area and climbed aboard, buying tickets from the driver. Then began the long trip out of the airport. After everyone was loaded on at our point, we began to circle the airport pick-up points at the terminal. This was an area no bigger than a quarter of a mile, and it took us about one hour to traverse these stops before we finally broke loose and headed out of the airport. The airport feeders eventually gave way to the express roads into the city and before long we were approaching the suburbs of Paris. Greg remarked about the excessive amounts of graffiti everywhere we looked. Little did we know at this point in time that this would be a common sight all over the Europe through which we would pass. We made several stops before reaching Montparnasse, so we had a sort of mini-tour of the city that included crossing the Seine a couple of times. We disembarked the bus outside the Montparnasse train station, retrieved our bags from the underneath compartment, crossed the street at the far corner, and headed up Ave. du Maine to our hotel location on Rue de la Gaite. As we were making our way to the hotel, I noticed several backpackers heading in the opposite direction towards the station, and it occurred to me that they were probably taking the late train to Bayonne and then on to St. Jean. As we expected, our room was not ready yet. The desk clerk allowed us to leave our bags in the teeny reception area and informed me that the room should be ready in about two hours. We then set out to get some exercise, locate the exact train station for our departure on Wednesday, and to get some lunch. We found the station near where the bus left us off and went inside to pick up our train tickets that I had booked ahead of time on-line. There were automated ticket machines that neither one of us could figure out to use, so we got in line to get our tickets that way. Once this was accomplished, we felt confident that all we had to do was show up on time and board the train early morning of the day after tomorrow. Now we could relax and try to get over our jet lag and lack of sleep. We found a little boulangerie just a few blocks around the corner on Rue de Depart where we found some great sandwiches. So we just sat inside and watched the bustling office workers while enjoying our lunch. It was overcast and rather chilly outside. Although there was some evidence of spring to be seen, the temp was probably still in the high 50’s. After eating, we took a leisurely stroll up Boulevard du Montparnasse and checked out the Eglise Notre Dame des Champs, sat in the gardens outside for a bit, and then made our way back around and down the Blvd Edgar Quinet to get back to Ave du Maine and eventually to the hotel. Our room was ready by this time and we began the comical process of lugging our bags up a very narrow spiral staircase three floors up to our room. The room was like a postage stamp, and there was no room to move around due to fact that the two queen beds took up all the space. The only way to get from one side of the room to the other was to shuffle sideways with our backs against the wall. After the steep ascent and shuffling episodes we were in hysterics, but we had not yet seen the pinnacle of humor in this place. After we had gotten our gear squared away, I went down to the desk to see about getting a WiFi code for our smart phones. The desk clerk told me the code was “vingt quatre zero et un deus trois.” I repeated in English that it was 240123? She said no. It was 24 zeros then 123. When I told Greg about this, we both lost it. We had the smallest room possible and the longest WiFi code imaginable. After several attempts to count correctly while hitting the zero key, I found that the code worked, but only in the lobby. So, I managed to sit on this ridiculously small ottoman in this tiniest of reception areas and get out an email to my wife Heather that were were safe and relatively sane in Paris. After a brief nap, Greg and I set out to walk to the Eiffel Tower. It took us nearly an hour but we made it and got some great photos of this iconic structure. 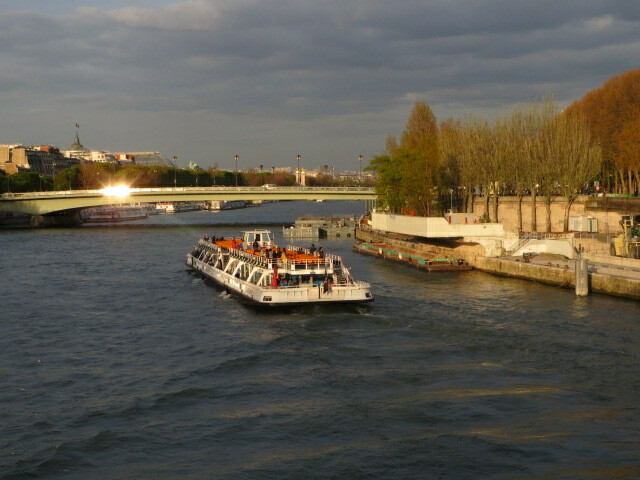 Then we walked along the Seine for a few blocks and finally made our way back to the hotel area. There we found a nice Italian restaurant and ate some pizza and lasagna, having a delightful conversation with a retired French couple who were in town for a conference. Then it was back to our room for a much-deserved sleep.